You’ll enjoy a true beach vacation in this spacious, cottage-style home, just steps from the beach! This home is in the heart of Crystal Beach, a quiet, walkable neighborhood with white picket fences and easy access to shopping, restaurants and activities in Destin, made even easier with the COMPLIMENTARY 4-PASSENGER GOLF CART. Sirenia is a large home, sleeping up to 16, with a sunny private pool, and a separate carriage house. It’s perfect for large or multiple families, or folks who just want a lot of space to spread out. The main house has a queen bedroom and a full bathroom downstairs, and upstairs you’ll find a large king master bedroom with ensuite bathroom and a large bunk room with 2 full-over-full bunk beds and a new queen bed. The bunkroom also has a full bathroom attached. The separate carriage house has a king bedroom, a full bathroom, living area and kitchenette. When you arrive, you’ll immediately appreciate the front porch - Adirondack chairs invite you to relax and switch to vacation mode. Inside, you’ll find a large open living and dining area with plenty of comfortable seating and an HDTV and blu-ray player. The large dining table seats 8 with space for 5 more at the kitchen counter. The NEWLY RENOVATED kitchen (November 2017) features stainless steel appliances and new quartz countertops. The kitchen counter is now all one height, opening the kitchen to the living spaces & providing more prep and dining space. You’ll find all the dishes, pans and utensils you may need, a Keurig D-Cup coffee maker, and even a few spices, to get you started. We want you to feel at home, and the large, open layout is a perfect gathering spot for your family or friends. Follow the extra-wide central hallway to the back of the home to find this lovely bedroom. It features a comfortable queen bed, a dresser, a roomy closet and a nightstand with lamp. You can relax in here with the HDTV and DVD player. There’s a full bathroom in the hallway next to this bedroom. Upstairs, at the front of the home, you’ll find the large, comfortable master bedroom with an inviting king bed, nightstands and lamps. There is even a desk and an internet-connected PC (free wifi) in this room, in case you need to do a little work or check emails while on vacation. Plenty of windows bring in the light, and you have your own private access to the lovely balcony where you can enjoy your morning coffee or relax after a day at the beach. There is also an HDTV with DVD player and a large dresser in this room, as well as a large closet in the ensuite bathroom. This bathroom is attached to the Bunk Room, and is equipped with a commode, vanity and sink and tub/shower combination. There is also a personal hair dryer and large fluffy bath towels for bunk room guests. This beautiful, bright bedroom features a BRAND NEW KING BED and a large nightstand with reading lamp. You’ll have plenty of space to settle in with the large dresser, and there’s a big walk-in closet across from the full bathroom. You’ll find the private, professionally maintained swimming pool nestled in the beautifully landscaped backyard. It’s all yours – enjoy it! There’s plenty of space to spread out around the pool with lounge chairs and 2 dining sets. A large gas grill on the back porch of the main house helps make dinners easy. There’s even a bistro table and chairs – another perfect spot for morning coffee or evening relaxing while grilling and watching the children in the pool. Pool heat is available for an additional fee. Crystal Beach is the gold standard of Destin...no high-rise condominiums or beaches packed with 4 rows of vendor chairs. Crystal beach is mostly residential, which contributes to the quietness of the neighborhood. Only a few steps away is the Shirah Street beach access, and the much larger ‘Shore at Crystal Beach Park’ with a pavilion and bathrooms is only 2 half-blocks down from there at Hutchinson Street where you'll also find Camille's coffee shop. 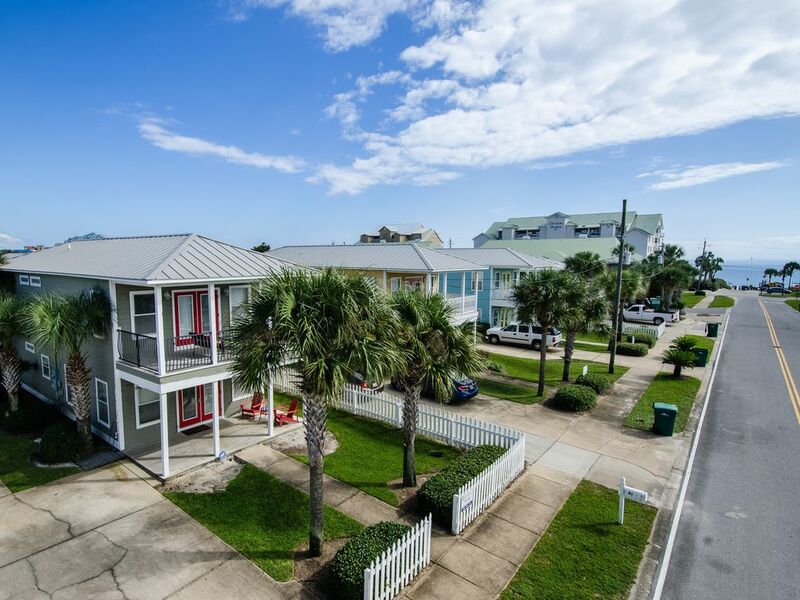 We offer a small number of first-class vacation homes in Crystal Beach. We take very good care of our homes and our guests. No one offers better homes than we do. We're local and will stop by and say 'hi' so we have to be proud of our homes. We know how difficult it is to find a vacation rental to suit your family’s needs, schedules and budget. We’re happy to assist you with the process of finding and booking the right place to stay for your vacation. We don’t leave you hanging—we do our best to get back to all email inquiries within an hour (and if you put your phone number into the inquiry form, we will call you)! Unlike many other people who never update their calendars, we always keep ours up-to-date. If this property is booked, ask about our other properties in the Destin area. We have been part of VRBO since its early days, being long time friends and colleagues of the founder. We are 'professional by owner' and understand the nature of this business better than anyone. We go above and beyond to bring you a great home. We are local and will meet you here, so we have to be proud of them and stand behind what we advertise. Nice living room with sofa, swivel chairs, recliner, large HDTV. We make sure there are ample place settings for as many guests as the home accommodates. A small number of family-friendly videos kept in the house. Unbelievable access to beach without paying thousands more for a house directly on the beach. Perfect Vacation! Great house, and location! Sounds like you had a great extended stay at Sirenia... We'll look forward to helping you escape winter again in the future! Lovely property close to everything! This was our first huge family vacation and it couldn't have been spent in a better place. So glad to hear you enjoyed your stay in our home! What an outstanding property! It had all the amenities of home but with all the luxuries of a vacation hideaway. The beds are super comfy unlike many rentals that I've been to. The beach is just steps away but if you are in the mood for fresh water, the pool is just right. I highly recommend this property. We have already reserved it for our next vacation! So glad you enjoyed your stay at our home and that it had everything you needed! I would give this 4.5 stars, but I'm rounding up. The location was great, just a short walk from the beach. When we arrived, there were donuts waiting for us which was a nice touch. There was a small issue with the door code when the other family who we were with arrived first, the door code we were given initially didn't work but that was resolved right away. Sugar Palms was great to work with, they checked in on us and they were easy to contact before we got down there. I was a little surprised we had to pay for pool heat but we did end up needing it, the highs were only in the mid 70s when we were there and there were several days when it wasn't feasible to swim at the beach. We spent a ton of time at the pool. And when we did go to the beach, the beach cart they provided was fantastic. There were plenty of restaurants that were within walking distance and there are a lot of conveniences that are right nearby. The carriage house is a nice bonus, we didn't end up using it a ton, we were two families and since our little kids still occasionally come into our room at night, we didn't want them wandering near the pool in the middle of the night to get to mom and dad. All five kids stayed in the bunk room which was fantastic, they loved it. Thanks so much for your kind words. We work very hard to make sure our guests have a great experience at our homes here in Destin. The Crystal Beach area is indeed a wonderful place for families to enjoy the Florida sunshine - with plenty to do and a great family atmosphere. This home is a favorite among our repeat guests...maybe it's the bunk room, the brand new kitchen or the carriage house - or the fact that it's just steps to the sand! Thanks again for staying with us -- we hope you'll become another one of our frequent guests! Very pretty property, great location! We have a 4lb yorkie and this was our first pet friendly home we have stayed in. I was nervous that the home would have dog hair everywhere since it was a pet friendly home but it was SO clean!! The location is absolutely perfect (1/2 block from beach). The pool was perfect for our family to enjoy. The pool house would have been great if we had my parents joining us. It’s not attached to house and gives a couple extra privacy if they stay in the pool house. The property can easily accommodate two families and also a couple(that can stay in pool house). Overall we were very pleased with the home and it’s cleaniless and all of its amenities. Made it perfect for our family of 5 (plus yorkie) to have an incredible week at the beach. We will be renting again for sure! Thanks for all of your kind words about our home and the cleanliness. We take CLEANING SERIOUSLY--we make sure all of our homes and condos stand up to the most discerning guests. We're happy to hear that you noticed and appreciated it. We look forward to hosting you and your family again. Separate carriage house - great for multiple or large families! Home also includes high-chair, iron & ironing board. Call for monthly rates for January/February Rates are subject to change until booked. Rate quotes on VRBO are approximations - call or email us for exact quotes, or if you have any questions at all. We love to speak with our guests! Cleaning fee and 11% tax applies to all stays.